Taking Action | What Can You Do? | What’s Being Done For You? Transportation and its infrastructure are at the mercy of weather at all times. Extreme weather is the most merciless in its impacts by creating huge problems getting from one place to another, or moving goods down commercial routes on both land and water. Many of those direct impacts, and many of the most important economic ones, can be specifically reviewed on this Web site in the “Impacts” area. Elsewhere in the site are descriptions of how during the Great Floods of 2010 in Rhode Island, the heart of Interstate Route 95 running through the metropolitan Providence area and next to the airport, As shaky as the economy is, do we invest now in shoring up our infrastructure or do we pay more, later, in dollars, lost productivity and potentially lives?and parts of Amtrak’s critical Northeast Corridor, were actually closed down for the first time since the Blizzard of ’78 and with for longer time and more extensive distances. What the horrible weather and rainfall did to rivers and marine traffic provided another reason to batten down the hatches. 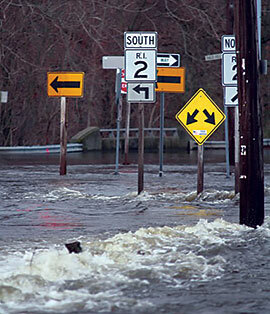 Moreover, the closing of these crucial arteries created risks for the ill, the elderly and others in need of medical attention Photo Credit: RIDOT or victimized by floods in private dwellings. And there is always the cost associated with such events. As shaky as the economy is, do we invest now in shoring up our infrastructure or do we pay more, later, in dollars, lost productivity and potentially lives? In Rhode Island, the state’s Department of Transportation (RIDOT) has identified key vulnerable areas that need to be addressed for future design, operations, and maintenance, in the wake of very harsh lessons in 2010. RIDOT then did this again just a few short years later after Superstorm Sandy in 2012 shut down major roads. Identification of vulnerable areas was revisited in light of the acceptance that other equally disruptive events are bound to follow, and we need to know our weaknesses. These critical issues translate directly down to municipal concerns, and further up to the national level, as climate change doesn’t limit its assault by size, shape or population. Total public investment in infrastructure in America is estimated at more than $300 billion annually, making it a valuable public asset worth protecting. Bridges and roads will be more susceptible to damage because of more severe storms and heavy rainfall. Approximately 60,000 miles of coastal roadways in the U.S. are already exposed to flooding from storms and high tides. As sea levels rise and storms become more intense even more miles of road will become vulnerable to damage and inundation. We hope you will find the information in the topic areas informational and instructive. We also welcome your feedback, which can be sent to the Climate Change Collaborative through the Tell Us What You Think page. Positions expressed in referenced media or links to external websites do not necessarily reflect the position of the RI Climate Change Collaborative.